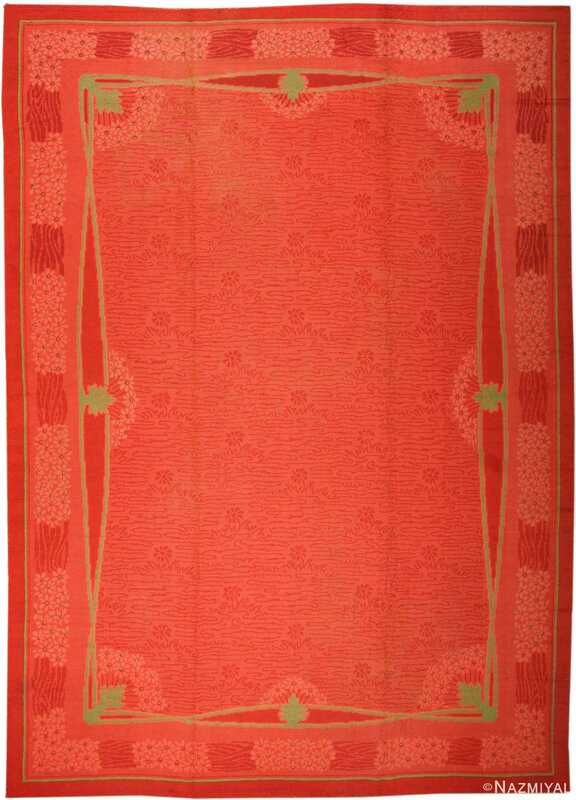 Vintage Art Nouveau Wilton Carpet, Country of Origin: England, Circa Date: Early 20th Century — This sensational vintage Wilton rug, showcases a refined, flowing organic pattern, awash with tones of lively coral which gradate toward deep, fiery reds. Floral details and precisely looping line work in opulent shades of gold echo and accentuate the symmetrical contours of this superb example of the Art Nouveau aesthetic. A brilliant blend of strength and subtlety, this vivacious design exhibits a bold, creative flair. Looked upon with fresh eyes, one will surely discover previously unnoticed facets in the sophisticated curvatures of this design. This Wilton rug is therefore certain to bring years of enjoyment to anyone who chooses to enhance their space with its striking presence. 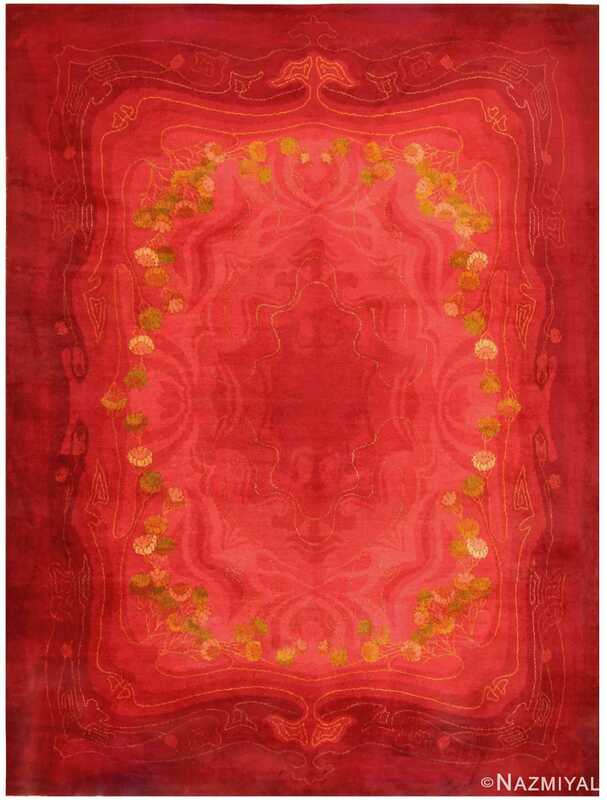 This gorgeous vintage Art Nouveau rug by Wilton Carpet Company, with its rich red and gold tones, calls to mind Old Hollywood and classic glamour. 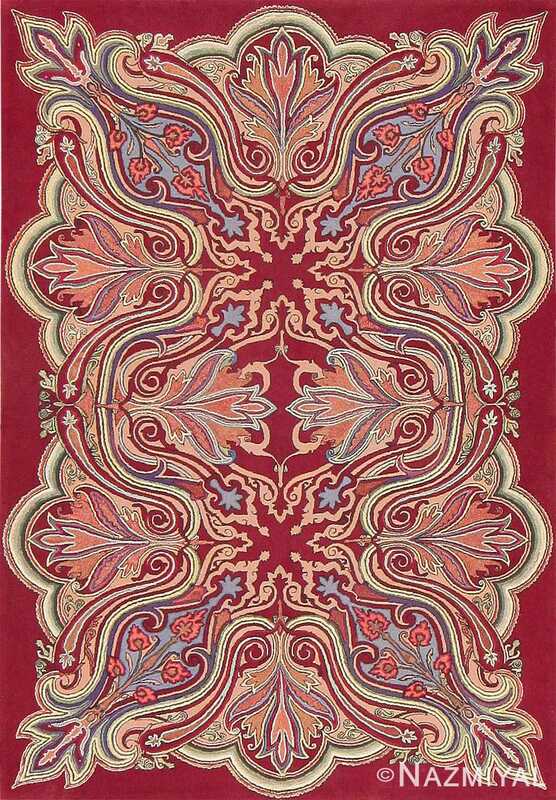 The Wilton rug company was founded in 1756 in Wiltshire, England. The region was known for its sheep farms and wool production, and as such many local artisans were skilled weavers and carpet makers. Before the establishment of the Wilton rug factory, local farmers established a cottage industry of independent carpet weavers, with artisans spinning wool and working on looms within their own homes. In 1699, the Royal Charter to the Clothiers and Weavers of Wilton was granted by King William III, which allowed the weavers of the region official recognition, and legally gave the master weavers a monopoly to carry out carpet sales in the area. Around this time, two master French weavers, Anthony Defussy and Peter Jemaule, were brought in to Wiltshire to teach the local weavers the expert Aubusson style of French weaving. 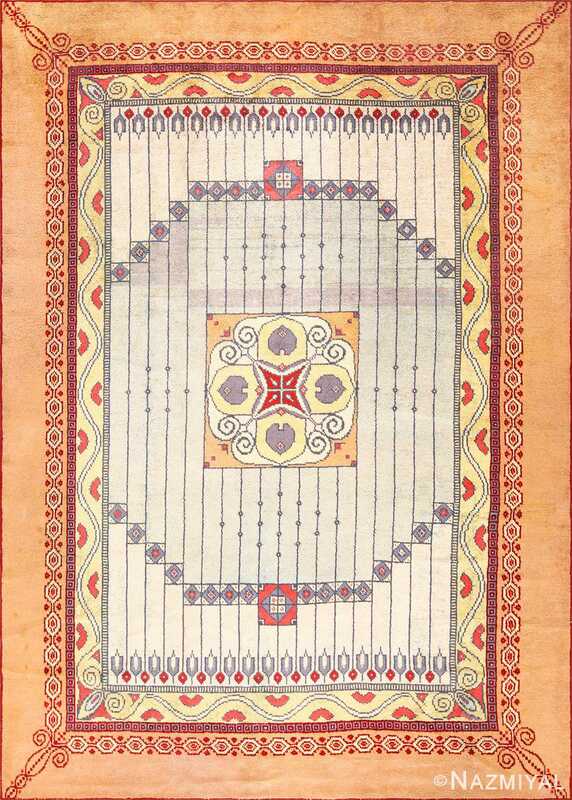 This technique was combined with traditional English designs, and would evolve into the classic carpets Wilton became known for. Soon, the popularity of Wilton carpets grew, and the company became the iconic brand it is today. This particular Wilton vintage rug, which was made during the early years of the 20th century, has a lovely Art Nouveau floral design. Its graceful curves and bold color make this rug a glamorous statement piece that would be wonderfully paired within an Art Deco or Hollywood Regency inspired interior. This beautiful and exciting American hooked rug is an exemplary Art Nouveau composition, featuring swirling tendrils and stylized floral arrangements throughout.